Jasmine Raznahan, magazine publisher and designer, on a photograph she took of an unknown artwork. JR I took this photograph on my old Leica Minilux at some point during a trip to Kassel for dOCUMENTA (13). I have very vivid memories of that whole trip, but to this day I have no recollection of seeing this image in real life. I chose it for many reasons. On a very basic level of appreciation, it appeals to my aesthetic taste. I love the faded colour and the graphic shapes – it taps into the part of my brain where Modernist architecture, Mexican cityscapes and Le Corbusier paintings live. The symmetry of all the planes coupled with those two doorways is really powerful to me. But I suppose the thing I find most beautiful about it is that it feels like this image was serendipitously imprinted onto one of the negatives in my camera without me even knowing it. Like I was taking pictures with my eyes shut but of things I knew I’d want to remember later. It’s a memory I can’t ever truly revisit. GB Is it a still from a film? JR The memory of this moment is so absent in my mind that I couldn’t tell you. That’s one of the things I like about looking at this image – trying to find clues as to what and where it is. The reflection on the floor beneath the central square implies that it’s an artwork in a room to me – you can see the grouting on what looks like the floor tiles. 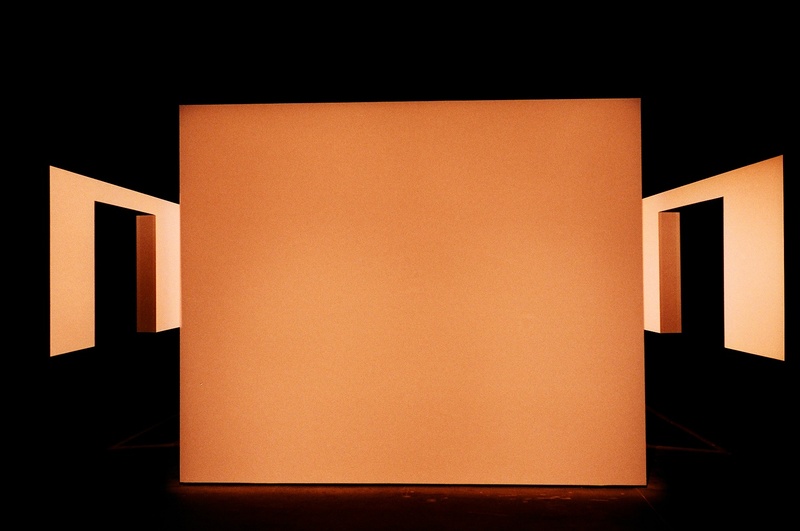 I imagine that the work was something similar in feeling to a James Turrell. GB Does the fact that you took the image with a film camera make it more beautiful to you? JR Yes. Had I taken it with a digital camera, I’d most definitely recall it as I’d have probably looked at our holiday snaps through the camera’s viewfinder enough times over to remember them. There’s something very otherworldly to me about this image which I’m not sure would have been captured if I’d taken this picture with a digital camera. I think that the inaccessibility of the subject makes the object more beautiful to me. Oddly, the clean gradients and the sharp lines in the image look as though they could be digitally rendered, which adds another layer of complexity to the process of trying to identify what it actually is. GB It’s interesting that you took the picture at an art exhibition. Bearing in mind that you don’t know the name of the artist, the title of the piece – and it’s out of its exhibition context – do you still see it as a work of art? JR That’s a really interesting question. I do still see this piece as a work of art, and a work of art that I imagine I like. But I can never be certain, as I don’t really know if it even looked like this in real life. I’ve trawled through the artist index on the website and in the catalogue and nothing seems to come close. It’s like it never existed. GB Do the memories of being at the show contribute to the beauty of the image for you? JR Maybe. For me there’s something quite romantic and solitary about this image. Inversely, my memories of the trip involve friends, colour, conversation, food, sunshine – quite the opposite to the way I read this picture. It is also unusual to capture a piece of work in a public gallery context that is devoid of other human beings. So really this picture captures a moment that is completely incongruous with the time that it was taken. I think this gives it a sense of mystery, which makes it more beautiful to me. It feels like a very private moment and there is a reticence about the image that fascinates me. I keep coming back to it, trying to unpick it. GB Do you think that this kind of abstract beauty needs no explanation in words? JR I think it depends on the context and also the person. You could describe the work of Luis Barragán as abstractly beautiful, and personally I find inspiration in studying the aesthetic shapes of it; by simply looking. But on reading more about his work you are able to understand it in a much deeper context and that multiplicity of understanding allows you to appreciate not only the aesthetic beauty but the intellectual too. When considering beauty, I think that is the ultimate combination. The Minimalists for me produced some of the most beautiful art and design of the 20th Century. Barragan once said that “architecture is an art when one consciously or unconsciously creates aesthetic emotion in the atmosphere and then this environment produces well being.” There are many moments in life that I would describe as beautiful but find impossible to intellectually define why. When he talks about this idea of ‘aesthetic emotion’, I think he is referring to this; a subconscious emotional reaction to something for reasons unexplainable. GB Does your work as a magazine publisher and designer affect your choice of such a simple, graphic image? JR Partly, yes. But there are plenty of other publishers and designers who I’m sure wouldn’t find beauty in this image. I think our aesthetic tastes are formed from a much earlier age than our late teens/early twenties, i.e. when we start to take a more vocational path in life. My brother was massively into music and all those amazing LP sleeves I was surrounded by as a six year old were definitely imprinted on my mind. Those graphic images are some of my earliest memories. I think it’s the same for everyone regardless of vocation. Our tastes are informed by the things we have grown up around, whether we choose to embrace or reject them. JR I think one of the defining factors of something that is beautiful is an inability to fully possess it. It is a combination of fragility, attraction, impossibility and nostalgia all in one.